New Delhi: Modernisation of India is dependent on modernisation of its water management, President Ram Nath Kovind said as he pitched for “localised” water management approach to empower villages. Noting that water was fundamental to “economy, ecology and human equity”, he said the issue was becoming more critical in view of climate change and related environmental concerns. “I would urge a water management approach that is localised. 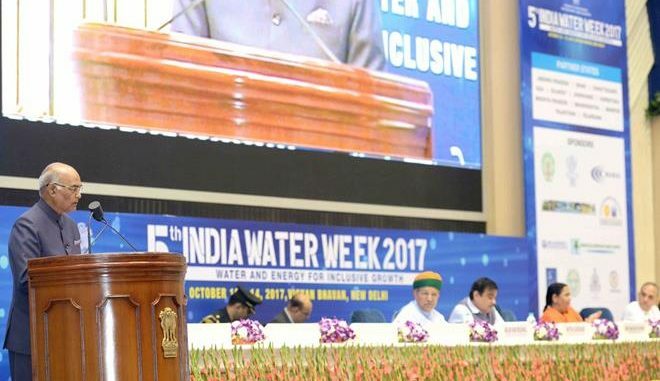 It should empower village and neighbourhood communities and build their capacity to manage, allocate and value their water resources,” Kovind said while addressing the 5th India opment News here. Noting that any 21st century water policy must factor in the “concept of value of water”, he said it must encourage all stakeholders, including communities, to expand their minds and to “graduate from allocating a quantum of water to allocating a quantum of benefits”. In India, he said water was central to some of the government’s flagship programmes. “I would go to the extent of saying that the modernisation of India is dependent on the modernisation of its water management,” he said, adding it was not surprising as the country supported 17 per cent of the global population but only had four per cent of the world’s water resources. He said better and more efficient use of water was a challenge for the Indian agriculture and industry alike. He said in India, 54 per cent of people were dependent on farming for their livelihood, yet their share of national income was only 14 per cent. To make agriculture more remunerative and for more prosperity of farming communities, Kovind said the government had introduced many new projects, including ‘Water for Every Farm’, ‘Per Drop, More Crop’ and ‘Doubling Farm Incomes by 2022’. Under the ‘Make in India’ mission, Kovind said India was working to sharply increase the share of manufacturing in the GDP from the current 17 per cent to 25 per cent by 2025. Kovind said the focus areas for ‘Make in India’ programme were manufacture of electronic hardware, computers and mobile phones–which require a large volume of water. Currently, 80 per cent of water in India is used by agriculture and only 15 per cent by industry, he said, adding that in the coming years “this ratio will change”. “The total demand for water will also rise. Efficiency of water use and reuse, therefore, has to be built into the blueprint of industrial projects. Business and industry need to be a part of the solution,” he said. In urban India, 40 billion litre of waste water is produced every day, he said adding it is vital to adopt technology to reduce the toxic content of this water, and to deploy it for irrigation and other purposes. This has to be part of any urban planning programme, he added. On one hand, the groundwater sources were being savagely exploited and depleted in some of the northern and western states, he said on the other, in eastern and north-eastern states, there was the challenge of overflowing rivers and of regular flooding. “Year after year, this damages human habitation and is leading to tragedies in countless families. Only a multi- stakeholder and multi-pronged approach can address such calamities,” he said. Stressing that “access to water is a byword for human dignity”, he said for India, providing safe drinking water to a population spread across six hundred thousand villages and urban areas is “not just a project proposal but a sacred commitment”.